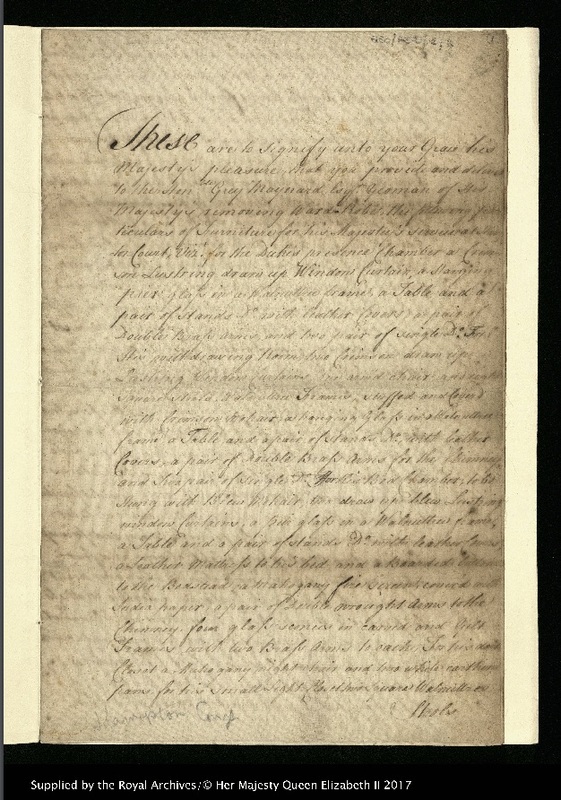 The first page of George II’s list of furniture to be purchased for the 1737 redecoration of Hampton Court, GEO/ADD/1/4. 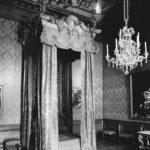 On June 24, 1737, King George II signed a warrant authorizing the purchase of furniture for the royal apartments at Hampton Court Palace. This nine-page list (GEO/ADD/1/4) detailed furnishings for the palace–for rooms for the King and Queen, but also for their children and their courtiers, including Maids of Honor. 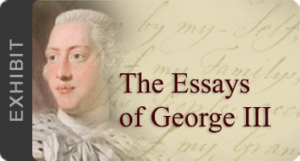 Exploring this document allows us to visualize the world of the oft-maligned George II, and provides insight into the material reality of life at the court of George II. Hampton Court Palace has a long history of renovations, as monarch after monarch sought to leave a personal touch on the building. It was originally constructed by Cardinal Wolsey, one of Henry VIII’s advisors. Wolsey gave the palace to Henry VIII in 1520, and it was that king’s favorite residence. In 1689, when William & Mary took the throne, they asked Sir Christopher Wren to redesign the palace. Instead of tearing down the Tudor-era part of the Palace, Wren added the Fountain Court, a beautiful Baroque palace, onto the older building. Queen Anne later called upon Wren to renovate the Royal Chapel. 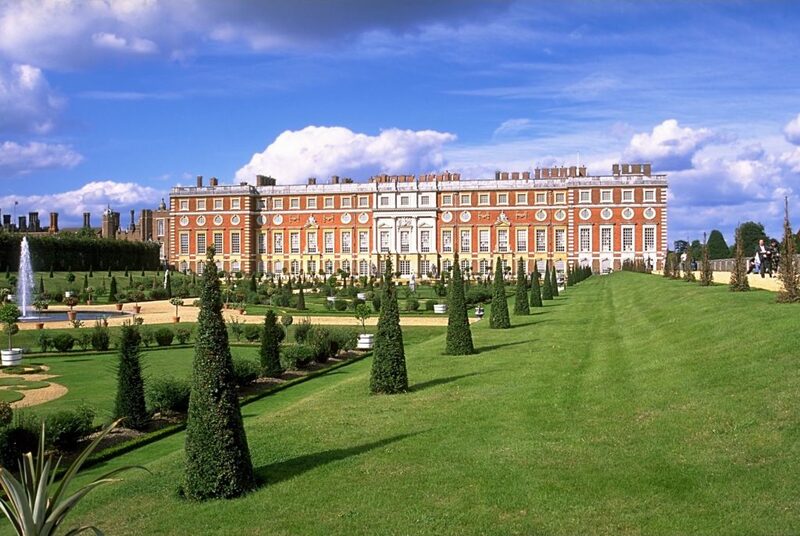 The south front of Hampton Court palace, designed by Christopher Wren for William & Mary. Photo courtesy of Andreas Tille, Wikimedia Commons. During the reign of George I, rooms were added for George, Prince of Wales (later George II), and his wife Caroline. George II was the last monarch to live at Hampton Court Palace, and continued to refurbish the building well into his own reign. 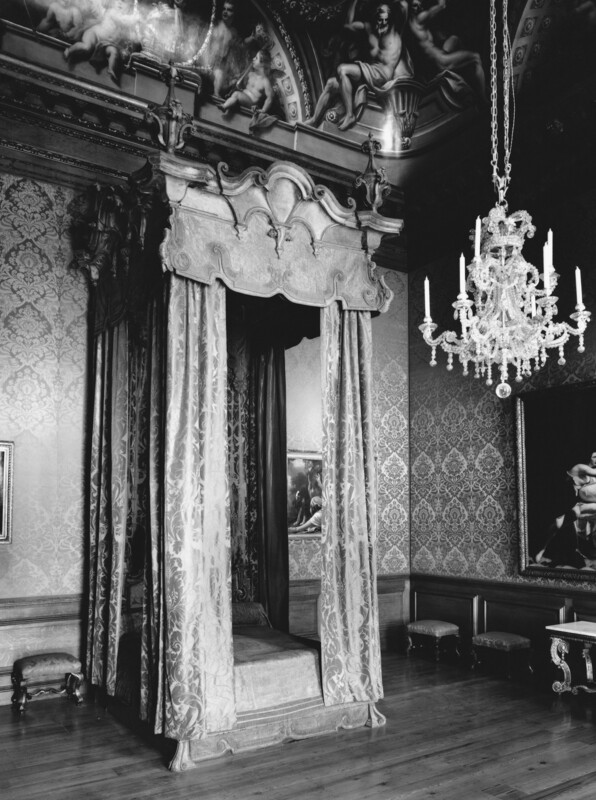 The 1737 warrant did not call for significant renovations of the rooms themselves, but rather for a complete redecoration of the royal rooms. 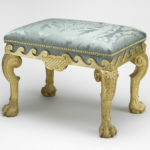 Gilt wood stool from Hampton Court Palace, 1737. 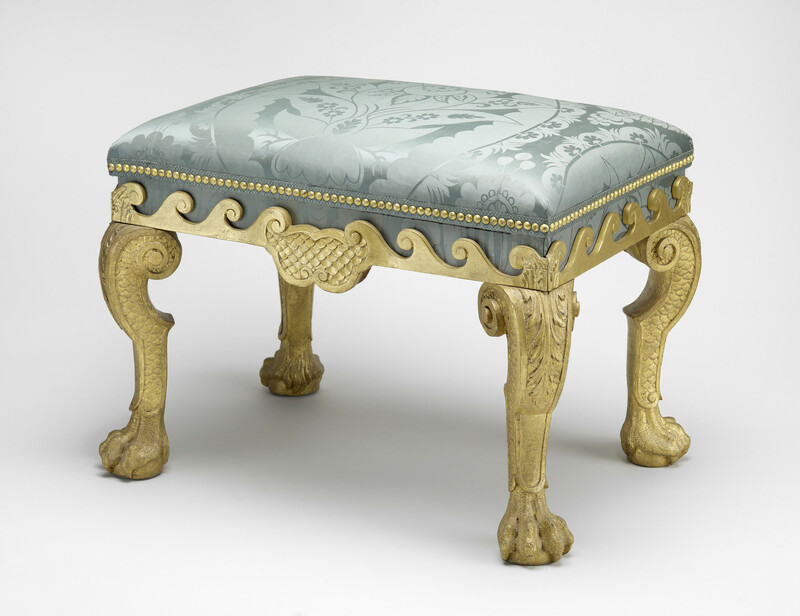 Image courtesy the Royal Collections Trust. 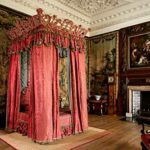 17th century tester bed at Holyrood House. Photo courtesy of the Royal Collection Trust. 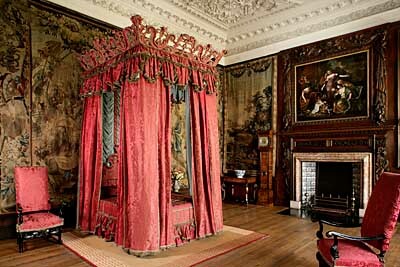 Bed for the Prince and Princess of Wales at Hampton Court, 1715. Photo courtesy of the Royal Collection Trust. 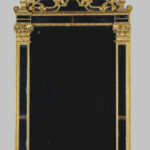 Mirror for the drawing room of the Prince of Wales, c. 1715. Photo Courtesy of the Royal Collection Trust. 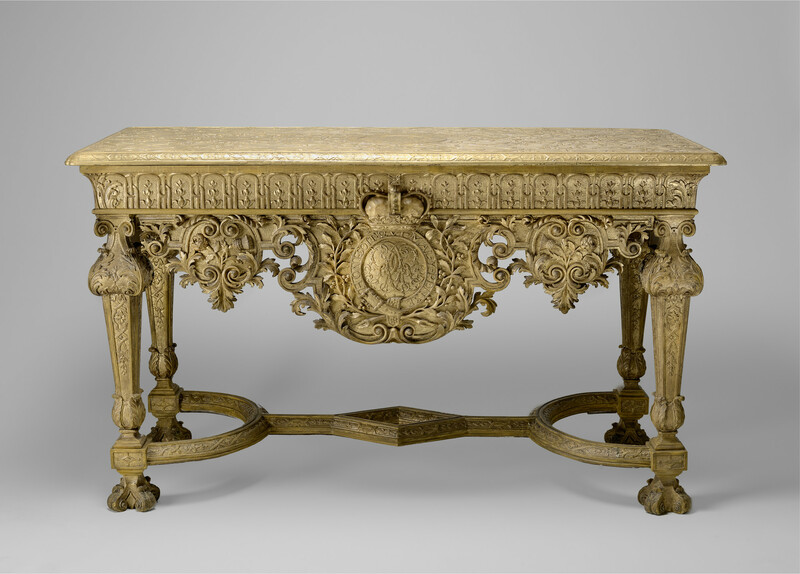 Pier Table for George I, c. 1723. Photo courtesy of the Royal Collection Trust. Furniture made of mahogany was expensive and only for the most wealthy consumers. The mahogany tree is native to the Caribbean, and this dark, easy-to-carve wood quickly became popular among rich consumers after British merchants began importing it from Jamaica at the beginning of the eighteenth century. 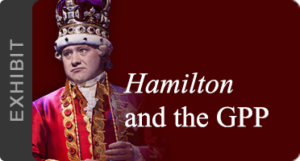 The Duke of Cumberland even had a mahogany “night chair,” or commode, with a “white earthen pan” to serve as a toilet bowl. 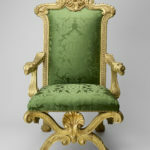 Mahogany “night chairs” were also ordered for Princess Amelia and Princess Caroline, Princess Louisa and Princess Mary, and the Prince of Wales. 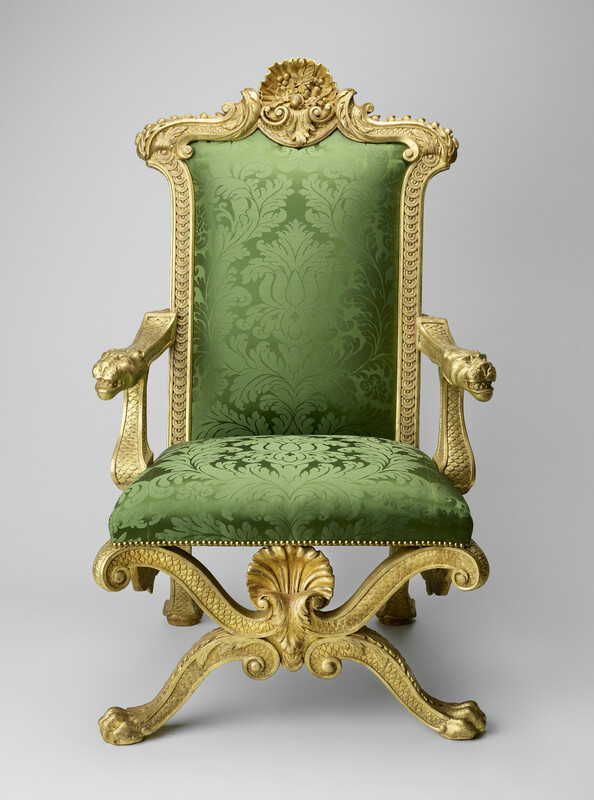 Night chairs were a necessary convenience in a large palace, especially before the advent of indoor plumbing. 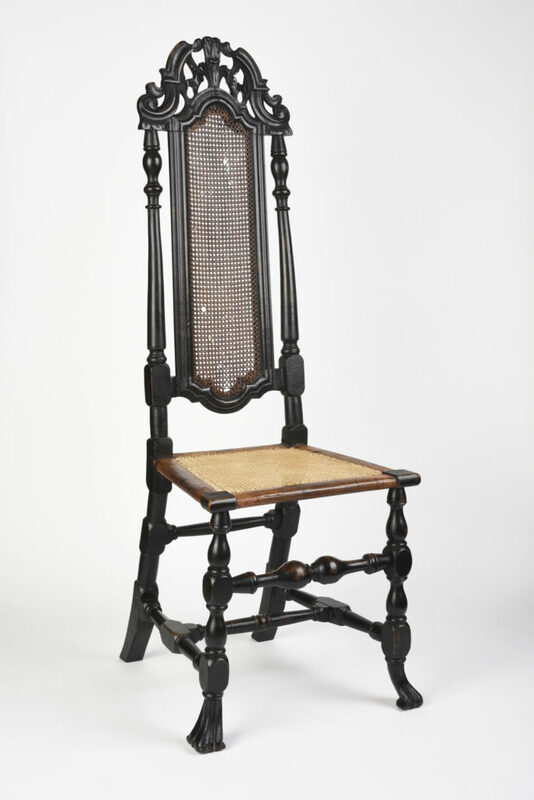 A side chair with a woven seat. Photo courtesy of the Winterthur Collection. 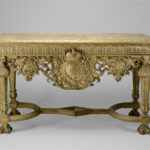 This furniture adorned other parts of the palace, not only the royal chambers. Chairs were ordered by the dozen, to stand in various drawing and dining rooms around the palace. Indeed, the majority of the chairs (294 of them, to be exact) were “matted chairs” like this one, made of beech, walnut, or other easy to find woods. These chairs would have been for the use of courtiers, visitors, and others who found themselves visiting Hampton Court, and needing a place to sit.